Winship Cancer Institute Executive Director Walter J. Curran, Jr., MD is the senior author of a new study in the New England Journal of Medicine that shows a treatment-related survival benefit for adult patients with grade 2 glioma who are treated with radiation therapy (RT) plus chemotherapy. "This study is significant because it is the first randomized trial ever for adults with low grade glioma to demonstrate a survival benefit for the investigational arm," says Curran, who also serves as NRG Oncology Group chairman. Although grade 2 gliomas constitute only five percent to 10 percent of all brain tumors, progressive neurologic symptoms and premature death result for nearly all patients diagnosed with this type of brain tumor. The Radiation Therapy Oncology Group (RTOG) 9802 trial (A Phase III Study of Radiation With or Without PCV Chemotherapy in Unfavorable Low-Grade Glioma) was initiated in 1998 in an effort to improve patient survival. RTOG researchers report the long-term results of this randomized clinical trial, which demonstrate that patients who received RT plus a chemotherapy regimen including procarbazine, lomustine (CCNU), and vincristine (PCV) experienced a longer progression-free survival (PFS) and overall survival (OS) than those who received RT alone. "These results provide further clarification about how the histopathologic differences among low-grade gliomas correlate with their biologic behavior and progression. 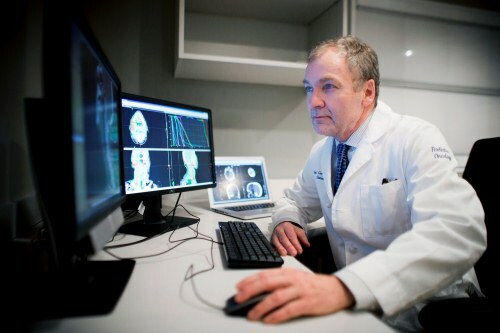 They also shed light on the most effective role and timing of radiation therapy and chemotherapy in prolonging progression-free and overall survival and minimizing morbidity in the younger age group of patients diagnosed with these brain tumors," explains Curran. The study's 251 eligible patients, enrolled from 1998 to 2002, had histologically confirmed grade 2 astrocytoma, oligodendroglioma, or oligoastrocytoma. Patients aged 18 to 39 years must have had a subtotal resection or biopsy to be eligible. At a median follow-up time of 11.9 years, 67 percent of enrolled patients were identified as having tumor progression, and 55 percent of patients had died. Patients in the RT plus PCV arm had longer median survival times compared with those in the RT alone arm (13.3 vs. 7.8 years, respectively; p=0.003). Median PFS time for patients receiving RT plus PCV versus RT alone was 10.4 years and 4.0 years, respectively.